as those having a chip name that starts with IPNxxxx, see Inprocomm. as those having a chip name that starts with RTxxxx, see Ralink. A substantial amount of additional information is available at MediaTek on Wikipedia. 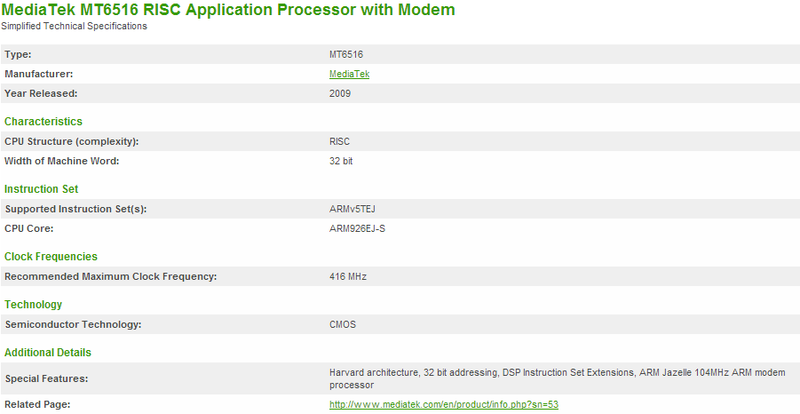 MediaTek MT7615 (AsiaRF WS3294) Spec. international regulations, giving end users the greatest performance any time and in any circumstance. MT7615 supports concurrent dual-band operation at 5GHz and 2.4GHz band (DBDC, Dual-Band-Dual-Concurrent). 5GHz band simultaneously. With the advent of 802.11ac, multiuser MIMO (MU-MIMO) is defined. multiple frames to different clients at the same time and over the same frequency spectrum. ARM Cortex-R4 CPU, 32-bit RISC MCU 0 devices 0 devices Spec. ARM Cortex-R4 CPU, 32-bit RISC MCU 0 devices 1 devices Spec. ARM Cortex-R4 CPU, 32-bit RISC MCU 4 devices 1 devices Spec. ARM Cortex-R4 CPU, 32-bit RISC MCU 1 devices 0 devices Spec. 1x1 802.11abgn/ac dual-band Wi-Fi subsystem and Bluetooth subsystem. The Wi-Fi subsystem includes 802.11abgn/ac radios, basebands. 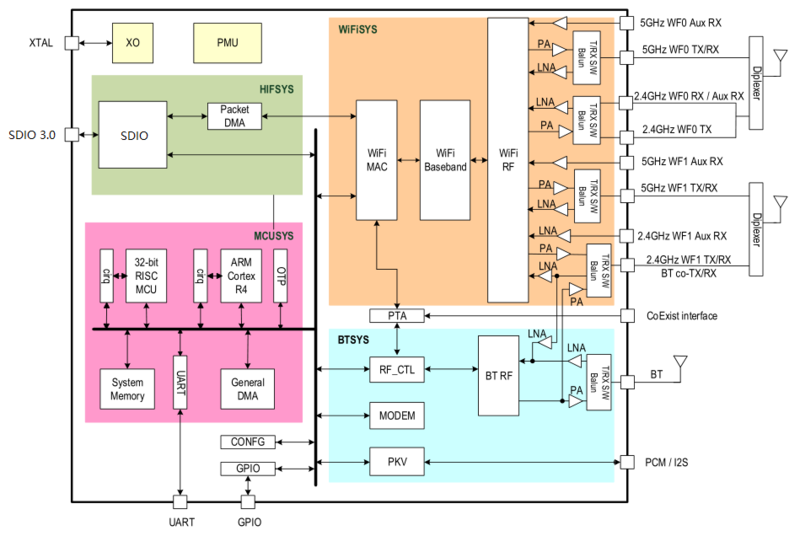 Baseband and MAC for low power and high throughput applications. 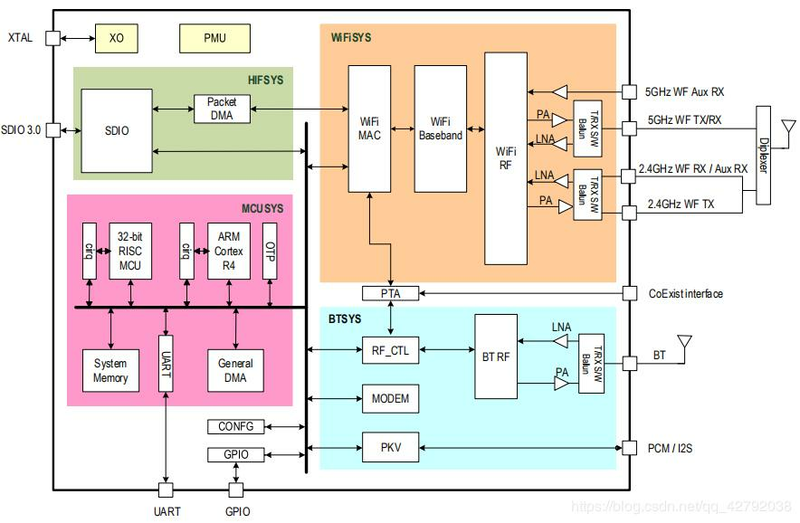 an ARM Cortex-R4 Microcontroller that handles Wi-Fi and Bluetooth tasks. Unloading data frame processing in the Wi-Fi host driver. The Bluetooth subsystem includes a Bluetooth radio, baseband, and link controller. It also uses a 32-bit RISC microcontroller as the Bluetooth protocol. MediaTek MT7668AEN (AUN/ASN) Spec. • MT7668ASN (BSN/RSN) Spec. MT7668BSN supports BT 5.0, for Bluetooth networking, such as smart street lights. for 802.11ac + MU-MIMO, Wave2, Wireless LAN. GMT-7668-S is based on MT7668ASN/MT7668BSN/MT7668RSN solution. Router, CPE, USB Dongle and all kinds of smart hardware. 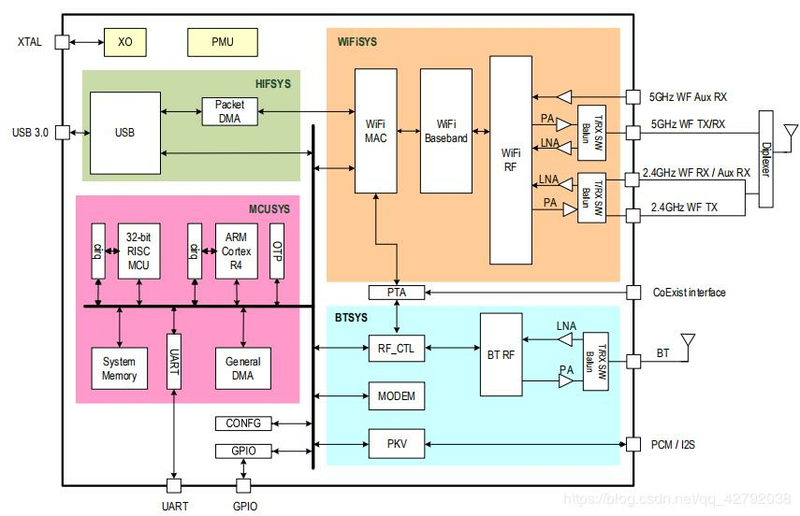 Early MT59xx chips are the fruit of MTK's acquisition of Inprocomm (Integrated Programmable Communications, Inc.). and an ADSL2/2+ wired ADSL modem application together on one chip. It includes a 32-bit network processor and a powerful ADSL Discrete Multi-Tone (DMT) engine with enhanced features. The MT7502 also integrates one 10/100 Ethernet MAC with one 10/100 Ethernet PHY, and an ATM AAL5 hardware SAR. The MT7502 is a simple one-chip solution for ADSL wired applications maximizes flexibility for system designers. compliant with various standards defined by ANSI and ITU-T.
(SPA) for wired-speed performance enhancement. 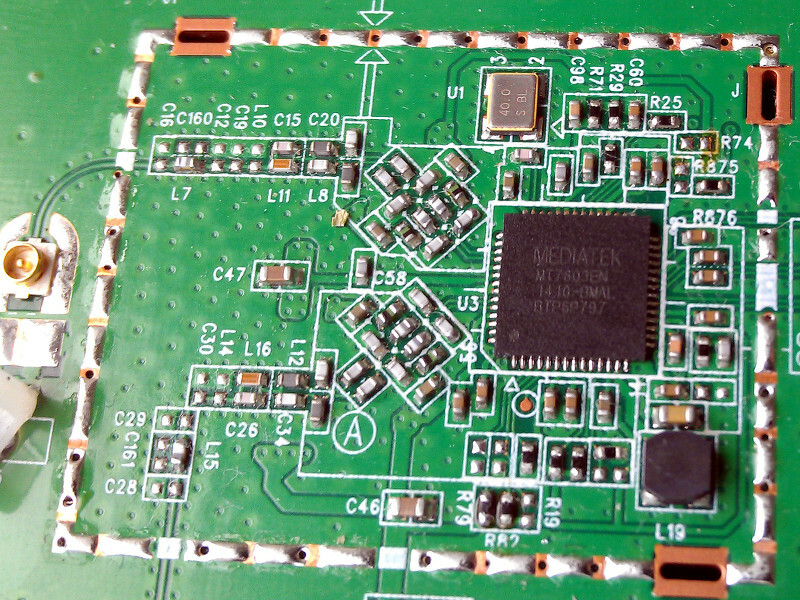 MT7505 also MCM DRAM inside for smaller PCB size. defined by ANSI and ITU-T.
in cost, functionality and performance. RT63368 is designed for Ethernet bridges/routers, WLAN residential gateways. used with Ralink RT63087 analog front-end (AFE), it performs a simple two-chip solution for bridge/router applications. standards defined by ANSI and ITU-T. It also incorporates USB 2.0 port, PCIe port, and an ATM AAL5 hardware SAR. MT7520 series are the highly integrated single-chip solutions combining EPON and GPON application. It also integrates 1 Gb Ethernet PHY. QoS, security and flexible protocol management. It also provides IPSec engine with high throughput capability. With integrated PMU and leading green technology, MT7520 series enable the simplification of system design. It provides low system cost and ultra-low power (CoCv5 compliant) consumption solution in the market. MT7525 series are the highly integrated single-chip solution combining EPON and GPON application. It also integrates four GbE MACs with four 10/100/1000 Ethernet PHYs, USB2.0 host, PCIe, and VoIP interfaces. With integrated PMU and leading Green technology, MT7525 series enable the simplification of system design. It provides low system cost and ultra-low power(CoCv5 compliant) consumption solution in the market. MT7530B is a highly integrated Ethernet switch with high performance and non-blocking transmission. It includes a 7-port GbE MAC and a 5-port GbE PHY for several applications, such as xDSL, xPON and WiFi AP. MT7530D is a highly integrated Ethernet switch with high performance and non-blocking transmission. It includes a 5-port GbE MAC and a 5-port Gigabit Ethernet PHY for Dump and Smart Switch applications. This page was last edited on 17 April 2019, at 19:00.